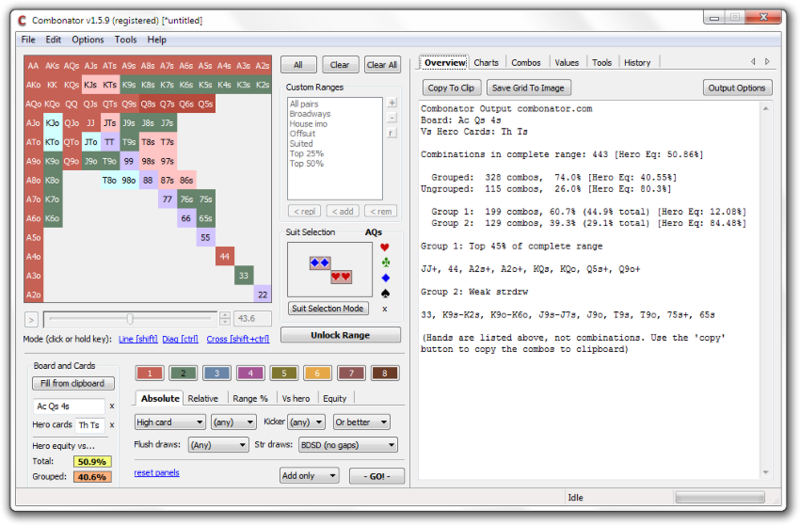 Combonator is a next generation study tool for Texas Hold'em games. Analyze combinations, board textures, range equity and balance in one fast, lightweight all-in-one app with no calculate buttons and no waiting. Combonator is not your average equity calculator. Instead of having to select one range then click calculate to wait for answers, Combonator allows you to quickly select and divide a hand range into one or more groups using manual and automatic selections. See equities, combination counts, and hand value breakdowns: instantly. Combonator will help you learn flop textures, how ranges split up on boards, how equities shift on turn and river cards. Join thousands of poker players using Combonator to learn and improve their Hold'em strategy. First, we start with a preflop range. 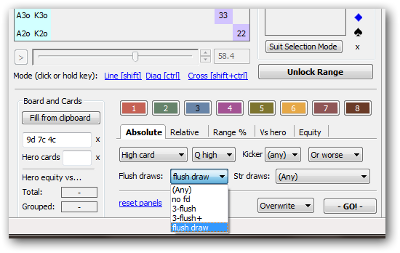 Get started by selecting a preflop range for the scenario you are analyzing. Custom rankings, saved ranges, and advanced selections means it only takes a couple of seconds to get started. Then, we can assign this range into groups. No waiting around. Get results instantly. 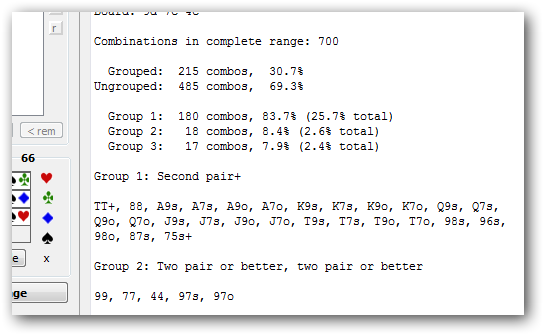 Get output for an individual group, or all groups: combination counts, equities against hero's hand, and hand values in the range. Data updates instantly as you work! No calculate buttons, no waiting. Explore ranges and scenarios organically and intuitively. 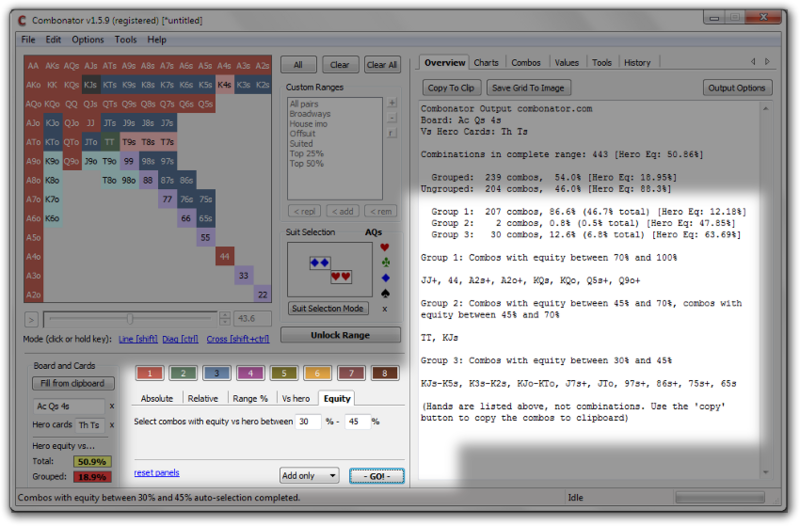 Combonator provides an open-ended suite of tools for poker study. Here are some of the tools at your disposal - all in one easy to use interface. Both equity calcs and combination counting  instantly as you update ranges. Board texture analysis for seeing how ranges hit different boards. Advanced preflop and post flop range selection with manual suit selection, and custom preflop rankings. 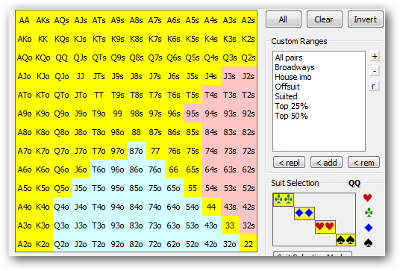 Next street analysis narrows a range down as you proceed through a hand to analyze turn and river decisions. Assign a range into eight groups. Instant heads up range vs range equity calculations preflop, "vs equity" hand list, anod more. Graphs, reporting, export, customizable calculator and a whole lot more. What makes up my opponent's perceived range? How does this board texture hit my opponent? What equity do parts of my range have? How is my own range balanced in this spot? What's the top and bottom part of my range here? How does an opponent's range narrow throughout the hand? 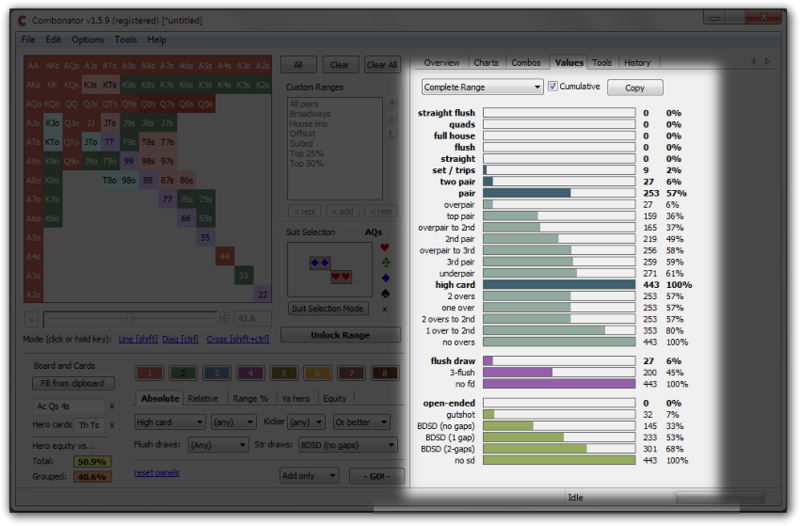 Combonator doing its thing: Equity and combinatorial analysis output as you update the hand grid. Slice up ranges like a ninja and get instant feedback. Flop texture analysis: Find out how a range, or grouped selection, hits a board. Broken down by pair and high card value, as well as straight and flush draws. 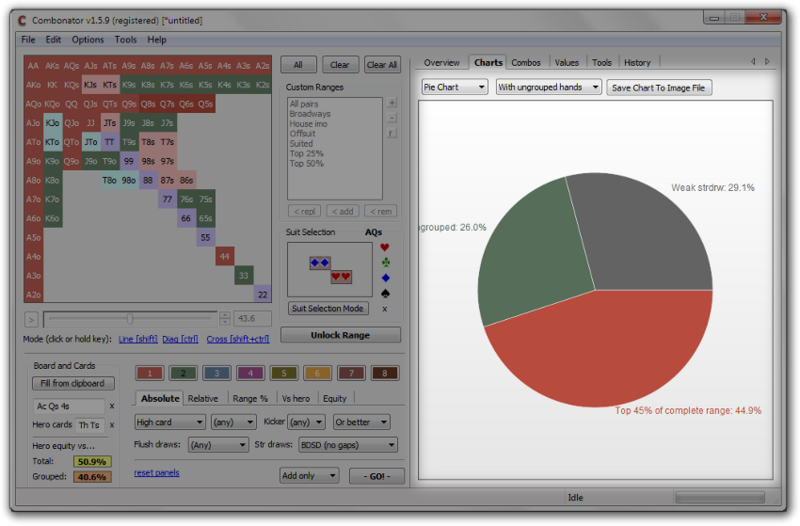 Natty graphs: See combination size of groups with handy pie and stacked bar graphs. Updated in real-time. Advanced auto-selection: Assign combos into groups in just a couple of clicks. 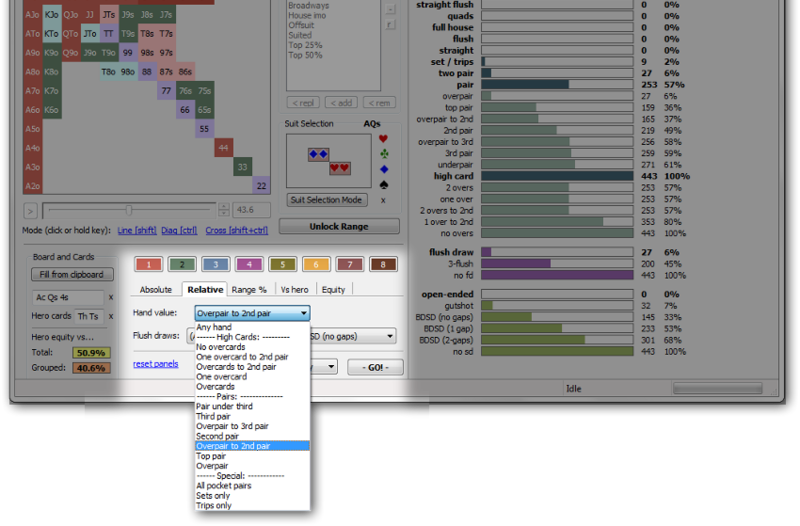 Powerful rules in absolute and relative strengths are only a dropdown away. Auto-select based on equity is one of many additional auto-selection options in the toolbox to quickly break down a range. Price free $45with free lifetime upgrades! "Your software is great for dissecting ranges in detail, and also works for seeing how often various ranges 'hits' various boards ... great software! "Markus D.
"I wouldn't be without Combonator now. It has allowed me to easily explore parts of Limit Holdem which before seemed overwhelming and it continues to prove to be an invaluable tool to both myself and those I now coach" "Boomer", LHE player and PokerStrategy coach. "The best thing about Combonator is that you don't just get an answer to your original question, but that in the process of the analysis you can understand the logical steps of getting the results. You get answers for lots of questions you hadn't even thought of! "Madorjan, LHE player and coach. "I came across your software few weeks ago but I didn't give too much credit at first ... but today I found a few videos about the Combonator and I have been just amazed as I didn't realize the potential of the software! It is great  congratulations and well done for make it and thanks for sharing with others!"CM. "Once again, I really think you've done a great job with this software, I've been looking for something like this for a while. Thanks!"Marianne. "I love it and have used it for hours a day for the past 6 months at least." Robert Como. "I have started introduce your amazing new tool to an Italian community  its getting a lot of interest!! ""Kiro"
"Wow am i impressed with this tool after only a few days of playing with it. As I study more advanced books they are fanatical about range ... I am following there examples and explanations [with Combonator] down to the decimal point. Scary cool."Greg. See purchase page for returns policy.